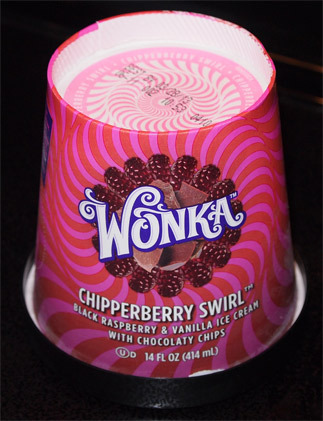 [New for 2012, retired April 2013] Oh Wonka, you make me feel like a kid again. I know it's all in my head, but I see these pints and I think back to school and reading Charlie and the Chocolate factory. I think what it would be like to be a kid again but I don't need to think too hard, I've got two of them running around all over the place. Well, one's reading, the other is pretending he's an airplane or Lightning McQueen. I know eating these free samples of Wonka won't make me a kid again, but let's pretend anyway. Notice anything? Look at the other picture again if you need to. Got it? No? There's no chips in the blackberry raspberry part. The vanilla part is inundated with them, but there's no sign of them in the raspberry. 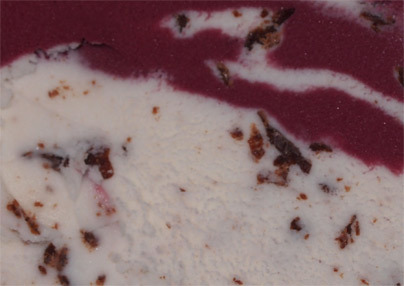 If you remember your math, this ice cream isn't [(black raspberry + vanilla) * chocolate chips] like the label might suggest, it's [black raspberry + vanilla * chocolate chips] .... ok, I don't know why I felt the need to do that, but you get the idea. Granted the black raspberry probably doesn't really need the chips because there are plenty in the vanilla, but hold on. You might think that's my main beef with this ice cream, but it gets worse. The black raspberry is strong, not sweet. I remember Ben & Jerry's magic brownie trying this same base combo but it came out too weak, here the combo comes across too strong. It doesn't help that the vanilla has no discernable flavor. I'm sure it's there, but between the raspberry and chocolate chips it's totally lost. Even if I just bite the vanilla (with chips, you can't avoid them), I just don't taste vanilla. Had the vanilla been cranked up to 11, instead of say, 3, this pint would have been more balanced. Since this is currently a Northern California flavor that most of us cant find in the store, I will describe it in another way. It's like Talenti Black Raspberry Gelato, but without the novelty of it all. They both have a lot of chips, but there's that something unique about Talenti's take on it all. 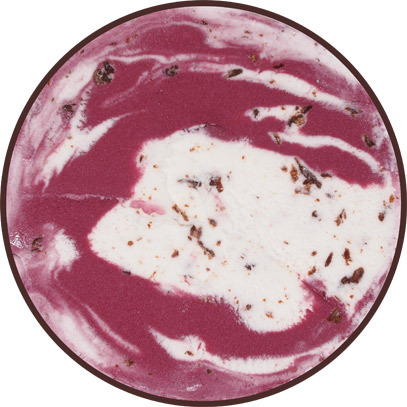 Talenti used a similar strong raspberry flavor, but the overall product was just more desirable. 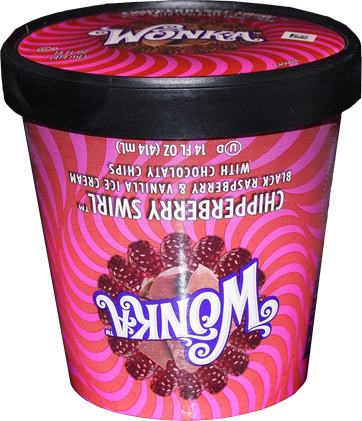 Here in Wonka's take it just seems, well, I wanted a fun flavor here and to me that would have been a sweet black raspberry base. So this one is a no go for me. Oh, I still polished it off, but it took three attempts. Heck, had I not had the Talenti version before, I'd probably be more impressed. I'll admit it, I'm disappointed. I know it wants to wow me with the crazy chip factor, and it's a respectable effort in that regard, but it's just not a winner for me.